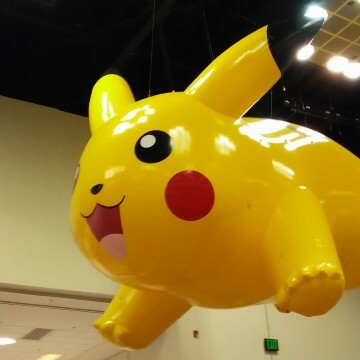 Over 5 days, nearly 19,000 people flowed through the halls of the Greater Columbus Convention Centre for this year’s Origins Game Fair – and I was among them! Another fantastic year of games at what I find to be a larger con with a great balance of demos, exhibitors and just straight up gaming. My only disappointment is that many publishers only have games for demo and not for release until Gen Con. Some games not even for demo, but just as a display at their booth. I do understand the flow of the industry calendar throughout the year, but can’t help but feel it’d be nice to walk away with a few more newer games! Let’s talk about what I got to put in front of myself while in Columbus. 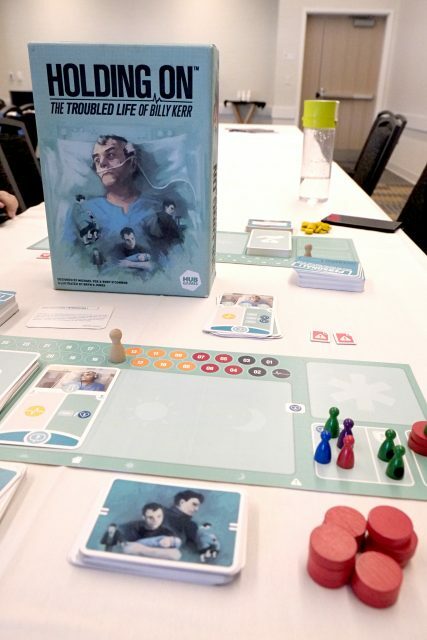 I got to demo not one, but two scenarios from the upcoming HUB Games Holding On: The Troubled Life of Billy Kerr, a co-operative game where players act as staff in a medical facility caring for Billy Kerr, who’s come in after a heart attack and memory loss. 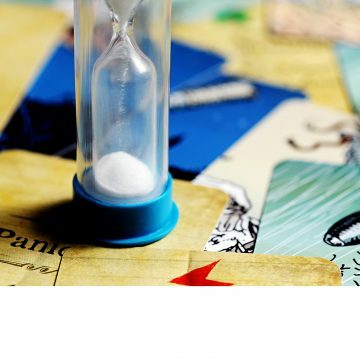 Each session is 13 “days” long – each day being 3 event cards that players have to negotiate their way through to maintain Billy’s health and wellbeing as well as trying to help him regain his memories. We absolutely loved our playthrough of these sessions – it’s got somewhat of a feel of a legacy game to it as you progress through the sessions and it feels a lot less “oh my god everything’s going to be ruined” than some other co-op games. I can’t wait to get my hands on a copy of this and write up a full review – I might even just try to write up a short review soon, because just thinking back on the two sessions I had has me excited all over again. I didn’t get a chance to dive into Untold or Blank, we’ll be getting to those soon! Osprey Games lures in with some gorgeous looking games, with the upcoming Wildlands (a Martin Wallace miniatures game – wild!) – this looks like a fabulous tactical miniatures game. Some deckbuilding and map action for the minis makes this one intriguing to me – the base game will come with 4 factions with expansions coming in November and February – not just new factions but their miniatures, too. I like the look of this one because it doesn’t seem too miniatures-heavy and looks like the perfect marriage of some of Osprey’s tabletop minis games with something more “traditionally” board gamey. Naturally, my eye was drawn to the beautiful new edition of High Society – those cards are unbelievable – and speaking of art, I got a sneak peak at the upcoming art for Cryptid thanks to Christian and it looks incredible – no surprise given it’s by Kwanchai Moriya! I’m really looking forward to these new editions to the Osprey catalogue – not to mention the Lost Expedition expansion coming out in September, with new characters (did somebody say a dog? I’m here for it!). 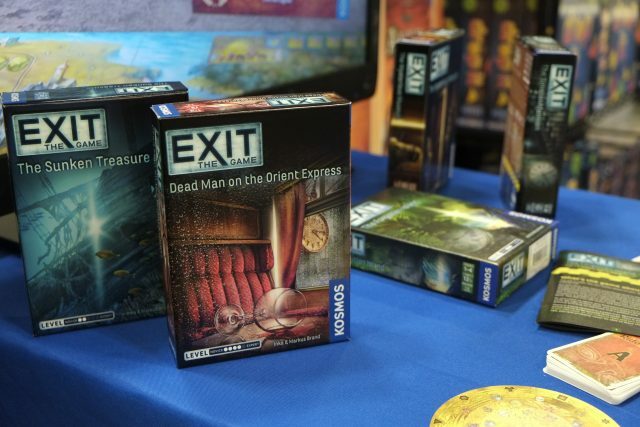 Over at the Thames and Kosmos booth, Exit games were flying off the shelves just as fast as Drop It was – it seems like T&K have found this fun niche of light family stuff, as well as the more in-depth strategy games. For the former, there’s Word Slam: Family which looks really cool – I’m a huge fan of the original, and seeing this in a more transportable form is terrific, not to mention them adding categories to word cards to make this far more accessible for light play. 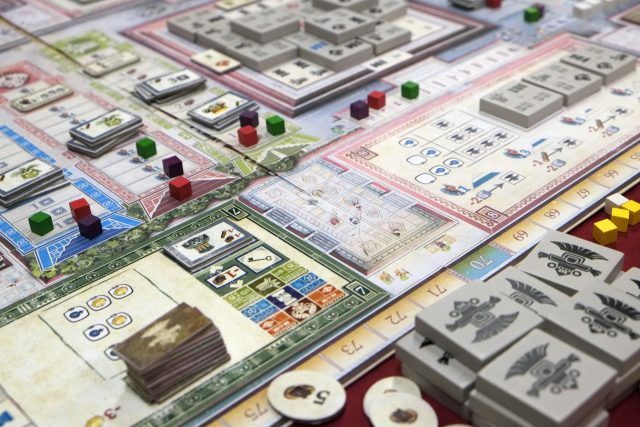 At GenCon there will be some of the more strategic games releasing – the new Rüdiger Dorn game Mercado (honestly, sign me up for any Dorn game) as well as the Imhotep expansion A New Dynasty will be on sale, and the new 2-4 player Lost Cities: Rivals will be available to demo. And while the already-released Exit games were hot property, I was excited to see the 4 new titles that should be in store as of now, especially The Mysterious Museum! Speaking of GenCon.. Well, this is some good news, at least! North Star games have negotiated a North American release of Die Quacksalber von Quedlinburg – and while it won’t be in stores until October 2018 due to a (very worthwhile) localized translation of the rules and the like, they will have a copy of the game available to demo at GenCon. 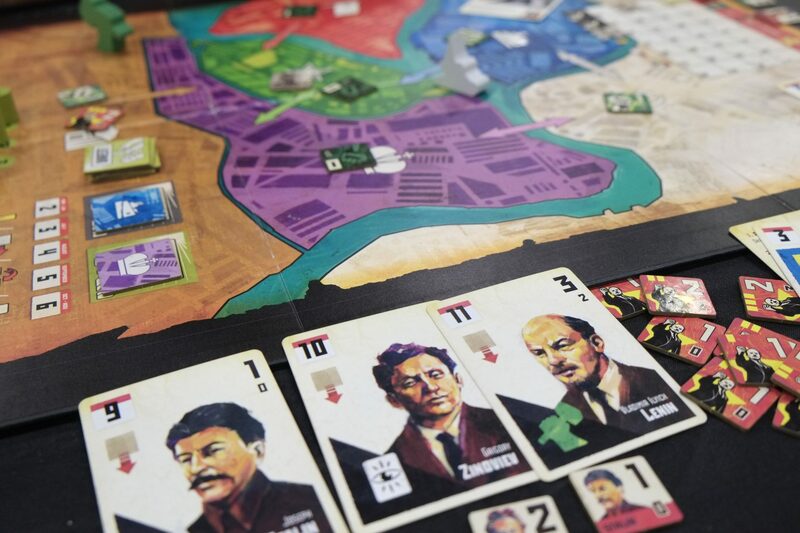 It is good to see them rustling up some non-party games for their catalogue – and coming up in August is the tile-laying Warsaw: City of Ruins, which I hope to give you a deeper dive into soon – I can’t resist a good tile-laying game, and this looks like such an intriguing theme. I hadn’t been super familiar with NSKN Games prior to Origins, but friends have been talking about them a bit lately and I’m intrigued. They had their recently-Kickstarted Dice Settlers on a table, but I was far more intrigued by the table presence of Teotihuacan. (Not so) Secret confession: I’m an anthropology/museum nerd and travelled a little in Mexico, including Teotihuacan, so this might have helped spike my interest, too! The game itself seems pretty up my alley – rondels for action, dice as workers and some tile-laying to build up a temple to boot. I chatted with Andrei a little bit and asked about the inspiration for the game, seeing as it’s coming from a European designer – it’s someone with a huge amount of interest who’s gone to the effort of ensuring that the cultural aspects represented in the game are appropriate – dress, art and the like. I didn’t catch whether there’d been any consultants from Mexico about it, but I appreciate that the game isn’t just a mash of a load of Mexican culture. As well as the art being culturally appropriate, the integration of it into the game board, and all of the little details of people that are wandering around at the site are really gorgeous. A wonderful, subtle touch that I love to see. I’m really looking forward to playing this once it comes out in October. If you’d told me Jordan and Mandy of Lotus fame had a Deathnote game coming out, I’d be pretty confused and surprised – but it’s happening! Ross from IDW showed me a production copy (it’ll be out in July) and even though I honestly have no idea about Deathnote content-wise, the game itself looks really cool. 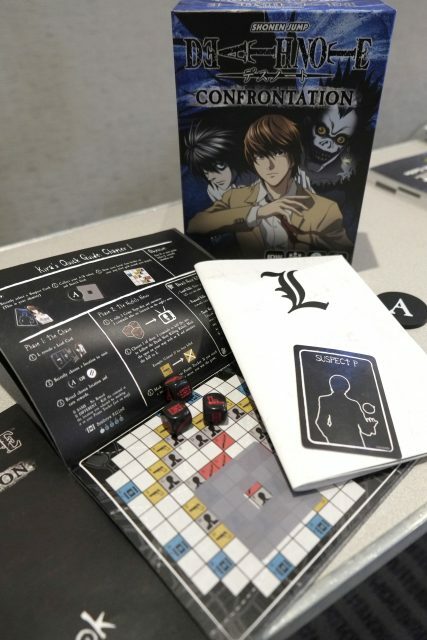 Deathnote: Confrontation is a 2 player hidden movement game, each player has a little booklet with a map – one of you is L, trying to lure out Kira to a location where he can be captured and the other is Kira, killing your way through a list of criminals trying to not be captured. There was some pretty unique looking movement and targeting stuff that I haven’t seen used before in a hidden movement game, and it’s certainly piqued my interest. And another surprise to me, Masque of the Red Death, a tense-looking deduction game based on an Edgar Allen Poe short story. Moving around, you need to gain yourself social standing by rubbing elbows at the party, but also figure out where the Red Death will be at midnight to avoid a grisly fate. The art on this is spectacular in a sort of creepy indie comic way, and I’m here for it – can’t wait to give it a try once it’s out in July. Queen Games were showing off their Spiel des Jahres-nominated titled Luxor, which I was dying to try but their booth was poppin’. It sounds like a wonderful Rüdiger Dorn game with some interesting set collection and hand management with a slight racing element – I look forward to trying it (it’s out as of Gen Con). Franchise, a remake of Medieval Merchants looks like an intersting network-building area majority game, and I was immediately drawn in by Ian O’Toole’s art – not sure if it’ll be interesting or not, but I’m very curious. I was also shown Skylands: King of Frontiers which was described to me as Carcassonne meets Puerto Rico – in that it’s got a mix of tile laying and action selection. Playing in approximately 45 minutes, I’m curious to see if this is a solid entry-level Euro strategy game. These last two titles are out at Essen, so perhaps I’ll get to try them at BGGcon in November. Thunderworks Games are really forging forward in the next 6 – 12 months if what Liesbeth showed me is anything to go by. I was impressed! 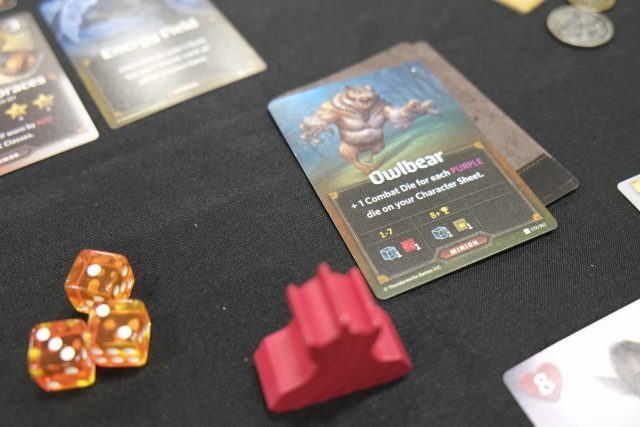 The Roll Player expansion Monsters and Minions which is out now had sold out by the time I swung by, but it sounds so intriguing – love the idea of adding fighting monsters to the market phase, and having a big battle at the end against a big bad. 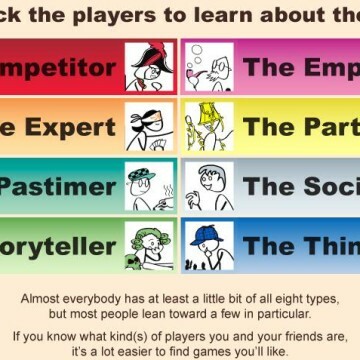 Not only have they spruced up Roll Player with this, but there’s a lot more coming. Another expansion similar to M&M is coming, called Fiends and Familiars, as well as a whole game set in the Roll Player universe where all the minions caught are thrown in jail; playing as one of them, you’re trying to make the most of your time if you can’t escape – make things comfortable, gain social capital among the inmates, but also stay on the guards side. It sounds hilarious! Keep an eye out for it on Kickstarter fall this year. I think overall with the Roll Player stuff i’m most intrigued by is Roll Player Adventures, a standalone game with a map board and storytelling aspects. Plus, you can generate characters using Roll Player which is amazing. We won’t see that one until Fall 2019, however. I also got a chance to check out the recently-Kickstarted Dual Powers, which is a really interesting area control game played out over the period of the Russian revolution. I’m not really a political gamer, but the integration of the time period and politics of the time into the gameplay look really interesting – plus, the colour palette and art (Kwanchai Moriya!) is so refreshing to see in a political strategy game! Once backers get their copies, it will be in retail early 2019. My last little nugget from the Thunderworks Games dungeons was to hear about a sci-fi themed game that’s coming Summer 2019 – with lots of hacking and secret corps involved. It might be a salve for the folks who are currently grieving the end of Netrunner! Bezier Games was abuzz, with a ton of demoes – there was a table going for One Week Ultimate Werewolf whenever I went by, having been the hotness as it was recently Kickstarted – the hidden movements around the map look like an interesting addition to the game, but I’m not certain if I’m up for something more lengthy in my social deduction games right now. I was most excited to see the Whistle Stop expansion, Rocky Mountains. It’s a module that’s inserted into the middle of the board and adds a 3D aspect to the map, as something you have to travel up and over, which seems really fun! I enjoy Whistle Stop, and I think this would give it a fresh feeling. I also got a quick demo of Werewords Deluxe which we failed at utterly, but it was fun to see some of the new roles in action – the Fortune Teller was especially neat. A lot of Bezier’s new releases will be in retail at/post- GenCon, but you’ll have to wait until Essen for One Week Ultimate Werewolf. I’ve heard a lot of buzz about AEG’s Space Base, so it was great to sit down and see what all the fuss is about. I can’t believe it’s been out since February and I haven’t crossed paths with anyone who has it yet! It’s got quite a Machi Koro-esque vibe to it, with building up a tableau that triggers when certain dice values are rolled – but it seems like a more mature version, with a lot more mitigation of the dice-based luck. I think I’ll take the dive into this one and grab it to try myself. One other title they were showing caught my eye – War Chest. 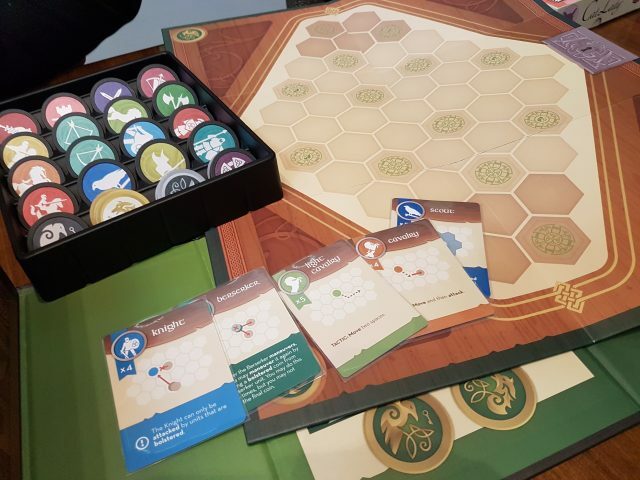 It’s a 2 – 4 player game that is essentially a bag builder that looks a little like Puzzle Quest except with nice poker chips, and a small board that players go head to head on – this will be out at Gen Con, so keep an eye out for it! Something new and fresh from AEG. Something not so fresh, but still popular is Thunderstone Quest – you can read David’s thoughts here. They’re going back to Kickstarter with it in a couple of weeks with solo ad co-operative play modes due to popular demand. Stay tuned and you might hear more from David about that! Other than these big stops, I tried to check out as much as I could while I wandered the exhibition hall. The absolute hotness titles seemed to be Welcome To… at the Deepwater booth, Junk Orbit at Renegade, and both Eastern Wonders and Coimbra at the Plan B booth. It was really great to see Detective: City of Angels being demoed at the Van Ryder games booth – I’ve been waiting a good long while to get this in my hands and it sounds like it’s just gotten better and better since I first playtested it! I also snagged two of their new Graphic Novel Adventures – after trying Captive, I was keen to get more – so I’ve got the Sherlock Holmes adventures volume and the Loup Garou volume to play through. Hope to give my thoughts on those soon! Can’t wait to see what will come out of the GNA in the next little while from them. I passed very briefly by the Tuesday Knight Games booth and in under 5 minutes I got a demo of That’s Not Lemonade, a fun little push your luck game they’re currently Kickstarting, and to hear about their RPG Mothership (available on Drive Thru RPG) – I want to play the latter and have the source book so I need to make this happen. Red Raven had their usual gorgeous fare on display, but I also was surprised to see a new Alf Seegert game, Haven – a beautiful looking 2 player game pitting nature against the city. Very intrigued to hear more about that one! I saw Shogunate being demoed at the Indie Board and Cards booth by designer Adrienne Ezell and I’m super excited to give that one a try. And wandering around I was drawn in by the fantastic mega-Onitama being played at the Arcane Wonders booth – it was sadly too busy for me to play, which is unfortunate as I still have yet to try that game and hear nothing but good things. So, you’ve made it this far – thank you! I hope I’ve given you some idea of the good stuff out there on the floors at Origins this year. It remains one of my favourite conventions because it is much less hectic than others, and I feel I get to experience more. Not only that, but the venue is pretty well maintained with plenty of space – but oh man there needs to be a change in the drinking water situation so we don’t end up parched. The food around Columbus is also a treat, especially with the convention centre so near the fabulous North Market; I think the best thing about the weekend that Origins falls on, though, is the fact it’s the same weekend as the Columbus Stonewall Pride Parade that goes right by the convention centre – there’s so many gamers that go out to watch and then seeing folks with their Pride get-up around the convention after really makes me happy. I am, however, disappointed that a lot of issues with harassment came up during the convention and highlights some ongoing problems with events of all sizes. I’ve seen my share as a woman in the hobby, but I think that Katie Aidley says it all best here. Polygon covered it too, including GAMA’s statement about the issue which I hadn’t seen anywhere else until now. I hope this is the start of a broader, serious conversation about better codes of conduct at events, and better support for victims. Let’s hope that GAMA/Origins can be a leader in that! 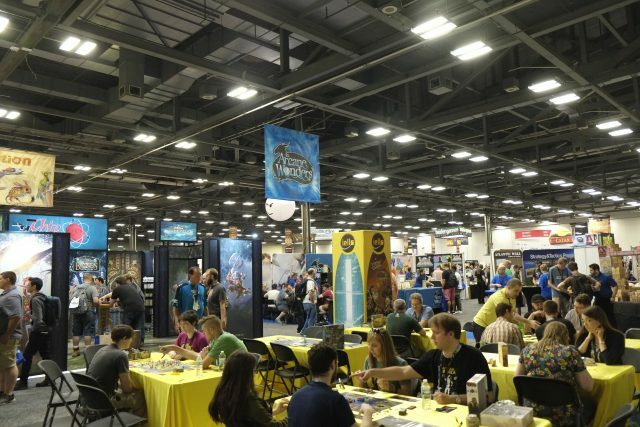 If you made it to Origins this year, I’d love to hear what you saw and tried – I saw all of the exhibition hall but still feel like I missed so much. 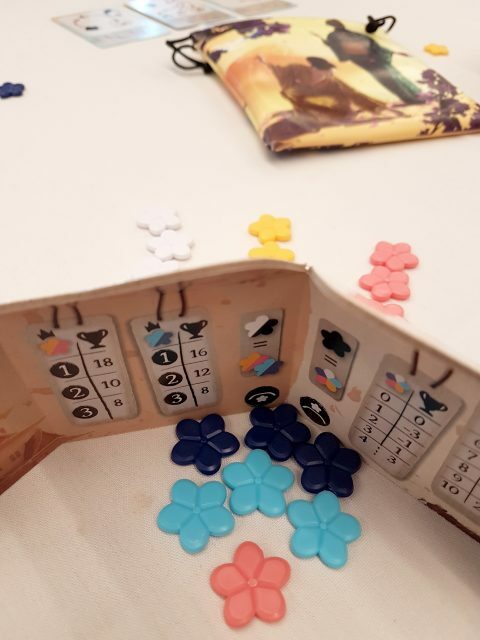 It was great to see what was buzzing so I can keep my eye out for things coming up – I saw a lot of Reef being played at the Plan B booth for instance, and just got to try that this past weekend which was terrific. Throw me your hidden gems, your favourite experiences! And see you there next year?